The photo was taken in an abandoned hidden military dock. 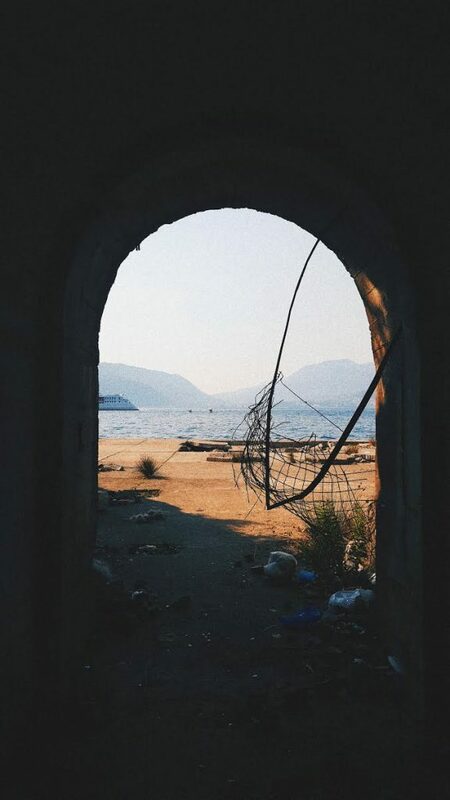 It is now in ruins, but it once served the purpose of hiding – a shelter for boats and the people. The local name for it is “potkop”, a Montenegrin word that does not have an exact synonym in English, but could mean “something in the ground”. The tunnels are eerie and dark, intertwined and they sometimes seem infinite, but you always end up in the area where the ships were stored. There, the sun reflects on the tips of waves, and shadows fall on the walls wounded by graffiti. In the past twenty years, it has become a junkyard, with empty cans and broken glass, plastic bags and shattered rocks everywhere. Once again it is at war, not for the people, but with them. I’ve explored potkop since I was a toddler, and because of it, I fell in love with ruins; history and beauty hidden in the cracks. ana m. finzgar is a teenager from the mediterranean. she loves music, movies and exploring.